“I haven’t been everywhere, but it’s on my list.” In this week’s blogpost: join us on a world tour, as we visit five of the most dazzling cinemagraph locations around the globe. Don’t forget to pack your cameras! Diversity is the art of bringing people together. At gallereplay we like to work closely with our diverse team of artists, spread across the continents. 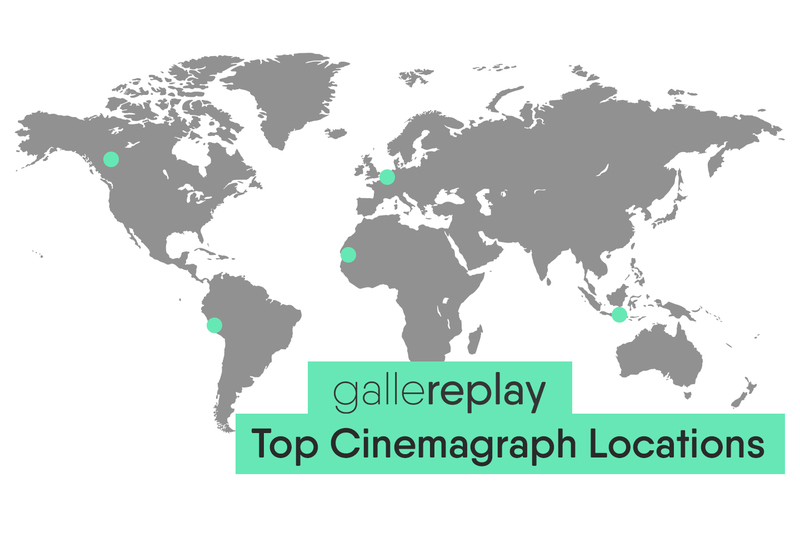 To celebrate this colorful mix of cultures, we’ve invited five gallereplayers, based in different parts of the world, to tell us about their favorite cinemagraph location. So pack your bags and join us on a journey around the globe! Our trip begins on the continent that we here at gallereplay call “home”. Exactly – in Europe! About 600km West of our offices in Berlin, lives our Dutch neighbor and nature expert, Floris Kloet. While Floris likes to travel around Holland to capture cinemagraphs, his hometown of Hilversum remains his favourite cinemagraph shooting location. The forests there – with their mystic beauty – never fail to enchant him. He likes to walk into the deep woodlands and surround himself with wild pine trees, soft moss and mushrooms. On his search for inspiring locations, he likes to wander around or consult his friend Google Earth, which often leads to new discoveries. For instance: a forest based on a cathedral, or a pyramid from the Napoleonic age, not far from his house. On we travel, from the mystic forest of Hilversum, to the shantytowns of Monrovia. Francois Beaurain is one of our French artists with a great fondness for Africa. He has visited over 15 African countries, but the city of Monrovia in Liberia has stolen his heart. Francois prefers to stay away from the African clichés portrayed by the mainstream media. In his work, he creates his own reality. Francois showing what he’s captured to the children of Monrovia. On his search for inspiring locations in Monrovia, Francois likes to wander around and connect with people on a deeper level by listening to their stories – a great way to bridge cultures! Next, we leave behind the streets of Africa, and move on to the infinite plateaus of the Canadian Rockies. Here we join Tyler Lillico, our “outdoors” expert. Tyler is based in Calgary, just a couple of hours away from the Rocky Mountains. Given the proximity, it might not come as a surprise that the epic North American Mountain range is home to some of his favorite locations. According to Tyler, once you enter the mountains, the choice of locations is endless. Endless views in the Rocky Mountains. Tyler likes to feed off what his environment creates, rather than recreating scenes in a studio. This is his way of creating unique and pure cinemagraphs. Let’s move South now, from the snowy Rockies to the Inca city of Peru – Machu Picchu. There, you may well encounter Guilherme Oisi, one of our South American artists, and his trusty camera. Though he originally hails from Brazil, his favourite cinemagraph shooting location is Machu Picchu, a 15th-century Inca citadel surrounded by mountains. Guilherme considers Machu Picchu to be one the most mysterious and magical places on earth. When he’s not travelling, Guilherme usually gets his inspiration from introspective moments like taking a shower or taking a walk in the park. “Adios” Machu Picchu, and “Selamat Datang” to our Indonesian artist Renzani Eka Prasetyo. Renzani likes to explore Asia. He has visited countries such as Hong Kong, Singapore, Japan and Thailand. Having seen so many beautiful spots, you’d think it would be difficult to choose just one, right? Wrong! The “Island of Gods”, also known as Bali, remains his all time favorite cinemagraph shooting location. Beyond Bali, his inspiration comes from the work of other photographers and videographers, and unpredictable moments during his travels. These moments provoke new concepts and fill his mind with fresh ideas. We’ve visited five different continents and traveled for thousands of miles. Unfortunately we’ve now reached our end destination – “home”! We hope you’ve enjoyed this colorful trip. Stay tuned for more adventures and cinemagraph journeys. Would you like a cinemagraph produced for your business in a remote part of the world? Our gallereplay artists are never far! Contact us at hello@gallereplay.com or fill out our Custom Production form.